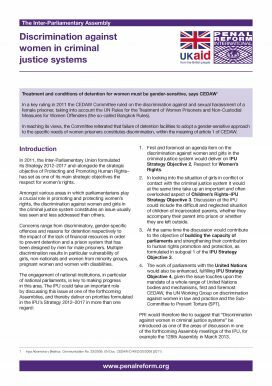 A series of short briefing papers produced for parliamentarians and policy-makers, which focus on the disadvantages faced by women and girls in the criminal justice system worldwide, and highlight examples of international good practice. These briefings were distributed at the Inter-Parliamentary Union Assembly in Quebec in October 2012. They are available in English, Arabic, French and Spanish.